There tends to be a decline in function and physical activity over time among older adults, particularly those who are living in long term care facilities.1,2 Older adults with functional disability are at risk for persistent deconditioning and more likely to be depressed and have a lower quality of life.3,4 Regardless of setting, the majority of care provided to older adults is by direct care workers (DCWs). Generally, the culture of care in any setting is to meet the needs of the older individual through task completion (eg, to bathe or dress the individual) rather than optimize underlying physical capability. Unfortunately, such attentive care may rob individuals of their remaining abilities. Thus, in the best interest of older adults, the philosophy of care provided to them should change such that their underlying capability is evaluated and they are helped to achieve and maintain their highest functional level and increase the time they spend in physical activity. This has been referred to as a Function-Focused Care (FFC) philosophy.5 This philosophy of care improves quality of life and enables older individuals to remain in the least restrictive setting (ie, at home or in assisted living rather than in a nursing home). There is substantial evidence documenting the many health benefits associated with all types of physical activity for adults of all ages.6-8 Conversely, there is no evidence that engaging in moderate physical activity results in adverse events.9 Consequently, experts believe that a philosophy of care such as FFC is safe and appropriate for all older individuals. FFC was developed to overcome the tendency to simply complete tasks for older adults. It is a philosophy of care in which the older adult’s underlying capability with regard to function and physical activity is evaluated and he or she is encouraged to function and engage in physical activity at the highest level possible. Examples of FFC interactions between caregivers and older individuals are shown in Table 1 below. Examples include using verbal cues during bathing so the older individual performs the tasks involved rather than the DCW bathing the individual; walking to the bathroom rather than using a urinal; or going to an exercise class. FFC was developed using a social ecological model that includes intrapersonal, interpersonal, environmental, and policy factors that influence behavior. Intrapersonal factors include physical problems such as anemia or degenerative joint disease, motivation issues, mood, and cognition. Interpersonal factors include what is said to the individual and the use of verbal encouragement to perform an activity or the lack of such encouragement. Environmental issues focus on things such as the height of a bed or chair that may inhibit function and the availability of clear open areas in which to walk. Policy is related to the law (eg, using a seat belt) or guideline that may increase or decrease function (eg, use of restraints following a fall). Implementing FFC into any setting requires an organized approach and the willingness and ability of a champion within the setting to initiate and support the process. The champion may be a nurse, a DCW, or a family member or friend in the home setting. Implementation is best achieved using four components: environmental assessment; education of staff, families, and residents; establishing restorative care goals; and motivating and mentoring (see Table 2 below). An implementation plan can be established to best fit the needs of each setting. Components of the implementation process are initiated sequentially until all four components become routine activities within the setting. Depending on the size, setting, and resources available, the champion is ideally acknowledged as such and should be able to spend time in this leadership role. As with any change-in-care approaches, the amount of time allocated to implementing an FFC approach will be higher at the beginning of the process and eventually will involve simple reinforcement and oversight once FFC becomes routine. The champion should identify a team composed of an advanced practice nurse and/or medical director or primary care physician, physical therapist and occupational therapist or recreational therapist or exercise trainer, activities staff and social worker as available within a setting to consult on items such as identifying FFC goals for each older individual, helping with resource allocation, integrating activities, and participating in the critically important ongoing motivation of the older individual and his or her caregivers. 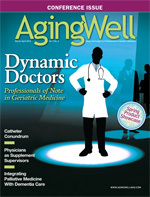 In the home setting, the team may be simply the older individual and a caregiver. Thus, providing this type of care for older adults may help decrease the cost of care and improve quality of life by helping individuals remain in the least restrictive living environment for as long as possible. — Barbara Resnick, PhD, CRNP, is president of the American Geriatrics Society and a professor in the department of organizational systems and adult health at the University of Maryland School of Nursing. She codirects the adult/gerontological nurse practitioner program and the Biology and Behavior Across the Lifespan Research Center of Excellence. She holds the Sonya Ziporkin Gershowitz Chair in Gerontology at the school of nursing and does clinical work at Roland Park Place, a Lifecare community. • Asks or encourages older adult to move in bed and gives him or her time to move. • Places older adult’s hands to facilitate independent movement (eg, on guard rail). • Asks or encourages older adult to move in bed but does not allow time for older adult to respond. • Moves older adult without asking older adult to help. • Pulls older adult up fully on bed without asking older adult to help. • Discourages or stops older adult from performing activity. • Older adult performs activity but with no involvement or encouragement from direct care worker (DCW). • Asks or encourages older adult to transfer and waits for older adult to move. • Places hands to facilitate independent movement (eg, places hands on walker). • Asks or encourages older adult to transfer but does not wait for older adult to initiate the transfer, just starts to pull him or her up. • Transfers or lifts older adult fully with no encouragement from DCW to have older adult perform any of the transfer. • Older adult performs activity but with no involvement or encouragement from DCW. • Asks or encourages older adult to walk or independently propel wheelchair and gives him or her time to perform activity. • Utilizes wheelchair instead of encouraging ambulation and does not encourage older adult to self-propel (even short distances or even with one hand). The identified facility champion worked with the research restorative care nurse (RCN) to complete environment and policy assessments using Environment and Policy/Procedures for Function and Physical Activity Evaluation Forms. The findings were used to identify and recommend appropriate and affordable interventions to alter the environment and policies/procedures so they would optimize function and physical activity of residents (eg make pleasant walking areas inside and outside sites). Education of nursing staff, other members of the interdisciplinary team (eg, social workers, physical therapists), residents, and families was done by the RCN using previously established materials and adult learning techniques. All staff in the communities were invited to attend the 30-minute educational session. For those unable to attend, a face-to-face session and a printed PowerPoint presentation was available. Hard-copy educational materials were given to all residents and made available to family members or proxies. The RCN worked with the champion and staff nursing assistants to complete Physical Capability Assessments and Goal Attainment Forms with each resident. Goals were established based on capability assessments, communication with other team members, and input from residents. In addition, the RCN identified intrapersonal factors (eg, cognitive status, pain, fear of falling, drug side effects such as somnolence) and worked with members of the healthcare team to implement interventions to optimize patient participation in functional and physical activity. The RCN also worked with the champion to make sure the goals were written into the required service plans for each resident. The RCN worked to motivate all caregivers to provide FFC throughout the 12-month period by observing caregiver performance and providing one-on-one mentoring to incorporate FFC into routine care, providing caregivers with positive reinforcement for providing FFC, meeting with caregivers to address their beliefs about physical activity and feelings and experiences associated with providing FFC, reinforcing the benefits of FFC and strengthening outcome expectations, highlighting role models (other caregivers who successfully provide FFC), and identifying change aides and positive opinion leaders to disseminate and implement FFC and eliminate the influence of negative opinion leaders. 1. Resnick B, Simpson M, Bercovitz A, et al. Pilot testing of the Restorative Care Intervention: impact on residents. J Gerontol Nurs. 2006;32(3):39-47. 2. Zimmerman S, Sloane PD, Eckert JK, et al. How good is assisted living? Findings and implications from an outcomes study. J Gerontol B Psychol Sci Soc Sci. 2005;60(4):S195-204. 3. Watson LC, Lehmann S, Mayer L, et al. Depression in assisted living is common and related to physical burden. Am J Geriatr Psychiatry. 2006;14(10):876-883. 4. Jang Y, Bergman E, Schonfeld L, Molinari V. Depressive symptoms among older residents in assisted living facilities. Int J Aging Hum Dev. 2006;63(4):299-315. 5. Resnick B. Implementing Restorative Care Nursing in All Setting. New York, NY: Springer; 2011. 6. Netz Y, Wu MJ, Becker BJ, Tenenbaum G. Physical activity and psychological well-being in advanced age: a meta-analysis of intervention studies. Psychol Aging. 2005;20(2):272-284. 7. Cress ME, Buchner DM, Prohaska T, et al. Best practices for physical activity programs and behavior counseling in older adult populations. J Aging Phys Act. 2005;13(1):61-74. 8. Prohaska T, Belansky E, Belza B, et al. Physical activity, public health, and aging: critical issues and research priorities. J Gerontol B Psychol Sci Soc Sci. 2006;61(5):S267-273. 9. Resnick B, Ory MG, Hora K, et al. A proposal for a new screening paradigm and tool called Exercise Assessment and Screening for You (EASY). J Aging Phys Act. 2008;16(2):215-233. 10. Resnick B, Galik E, Gruber-Baldini A, Zimmerman S. Testing the effect of function-focused care in assisted living. J Am Geriatr Soc. 2011;59(12):2233-2240. 11. Resnick B, Gruber-Baldini AL, Zimmerman S, et al. Nursing home resident outcomes from the Res-Care intervention. J Am Geriatr Soc. 2009;57(7):1156-1165. 12. Galik EM, Resnick B, Gruber-Baldini A, Nahm ES, Pearson K, Pretzer-Aboff I. Pilot testing of the restorative care intervention for the cognitively impaired. J Am Med Dir Assoc. 2008;9(7):516-522. 13. Pretzer-Aboff I, Galik E, Resnick B. Feasibility and impact of a function focused care intervention for Parkinson’s disease in the community. Nurs Res. 2011;60(4):276-283. 14. Resnick B, Pretzer-Aboff I, Galik E, et al. Barriers and benefits to implementing a restorative care intervention in nursing homes. J Am Med Dir Assoc. 2008;9(2):102-108. 15. Gruber-Baldini AL, Resnick B, Hebel JR, Galik E, Zimmerman S. Adverse events associated with the Res-Care Intervention. J Am Med Dir Assoc. 2011;12(8):584-589. 16. Resnick B, Galik E, Gruber-Baldini I, Zimmerman S. Falls and fall related injuries associated with function focused care. Clin Nurs Res. In press.